Welcome to the Kneehigh Ninja "Pop up" Indoor Playground. Our indoor playground is a great alternative for toddlers (ages 3 and under) to enjoy themselves in a roomy, safe, and fun filled environment. 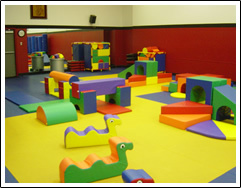 Our facility is equipped with a padded floor and various activities that will keep your child active and entertained. On those cold and rainy winter days, enjoy the comfort of an indoor facility where your kids will find a ton of fun! A maximum of 30 playing children are allowed on the floor at one time. Walk ins are accepted if room is available, but please always call ahead. To reserve a spot, please simply email us (link below) at least the night before. If you are a nanny, au pair, baby sitter or legal guardian, please read our liability waiver policy below! Playground dates "pop up" and are announced via email usually on the Sunday before. We are typically open during the months of November through March (Playground is open weekdays only). If you have a group of 15 or more toddlers, you can email us to request a private play date. If you do not have a reservation, please call us to make sure we are open. If you wish to be added to our email notification list, please send us an email at RheeFC@gmail.com. The playground will close at 11:30 AM if there are no children playing at this time. If you plan to attend during this time period, you must make a reservation in advance. For the safety of the infants and toddlers playing in our playground, the Ninja Indoor Playground is limited to children 3 years old or younger. 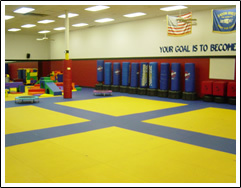 Jhoon Rhee Tae Kwon Do is located in the Falls Plaza Shopping Center between the Baskin Robbins Ice Cream and the Dry Cleaners. There is plenty of parking in the shopping center lot as well as the rear of the center by the CVS Drive through. Parking in the rear of the center is closer to our entrance. Once a playground date has been announced, please email us (click on the link below) to reserve your child's play date. Walk-ins are accepted only if room permits. Please always check our calendar and call before arriving as a walk in. Copyright © 2009 Kneehigh Ninja. All Rights Reserved.